At smile ‘n’ shine dental care centre it is our unending endavour to deliver satisfactory complete and partial removable dentures to our patients most of whom may be senior citizens to whom the clinic offers free consultation at all times. Removable partial dentures are for patients who are missing some of their teeth on a particular arch. Fixed partial dentures, better known as "crown and bridge", are made from crowns that are fitted on the remaining teeth to act as abutments and pontics made from materials to resemble the missing teeth. Fixed bridges are more expensive than removable appliances but are more stable. Conversely, complete dentures or full dentures are worn in patients who are missing all their teeth in an arch (i.e the maxillary or mandibular arch). The type of denture may also be classified according to the material being used. - Unbreakable valplast dentures which are also known as Flexible dentures. When it comes to dentures the most common source of agony is a bad fit. It’s something that’s hard to avoid since your gums are between a rock and a hard place. The rock is your jawbone, and that hard place is the hard acrylic liner that holds the prosthetic teeth. While some people can wear dentures without a single complaint, most denture wearers feel some discomfort while chewing foods. Even slight shifts back and forth can translate into serious gum problems over time. Reasons for discomfort and denture misfit are related to the ever-changing conditions in the mouth. As you age, gum tissue shrinks along with the jawbone. Hard dentures don’t adjust to new shapes and hence most long-time denture wearers end up using some form of adhesive to increase stability while wearing their dentures. There’s now a new wave of soft dentures, or flexible dentures, that promise to eliminate the problems associated with hard acrylic liners. They require no adhesives, will adjust to irregularities in your mouth, and stay in place even under harsh chewing conditions. The secret to these soft dentures is the undercut of the gum ridge. Flexible dentures hook into these undercuts to provide the stability needed to eat tough foods like apples and even hard nuts. A flexible denture is really just a traditional denture with a flexible resin coating as the last inner coating. It’s the flexible resin that locks into your undercuts and acts as a buffer between your gums and the hard base. 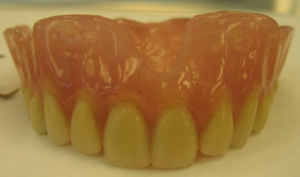 More flexibility can be added by constructing the entire denture out of this flexible material. These flexible resins are more expensive but also longer-lasting than your traditional soft liner. However, the material used happens to be non-porous so that no bacteria can build up within it. Even though it’s non-porous it can retain a small percentage of water to help interface with adjacent tissues. Another advantage to a soft denture is that the trial fitting can be used as part of the final denture, meaning that the overall production time of a soft denture is shorter than that of a hard acrylic denture. If you’re tired of the pains of wearing a hard denture, consider talking to your dentist about the possibility of a completely soft and flexible denture. Though it is not for every patient, it’s worth looking into because the results can often make a world of a difference. The first porcelain dentures were made around 1770 by Alexis Duchâteau. In 1791 the first British patent was granted to Nicholas Dubois De Chemant, previously assistant to Duchateau, for De Chemant's Specification, "a composition for the purpose of making of artificial teeth either single double or in rows or in complete sets and also springs for fastening or affixing the same in a more easy and effectual manner than any hitherto discovered which said teeth may be made of any shade or colour, which they will retain for any length of time and will consequently more perfectly resemble the natural teeth." He began selling his wares in 1792 with most of his porcelain paste supplied by Wedgwood. Single teeth in porcelain were made since 1808. Later dentures were made of vulcanite and then, in the 20th century, acrylic resin and other plastics. In Britain in 1968 79% of those aged 65-74 had no natural teeth, by 1998 this proportion had fallen to 36%. Problems with dentures include the fact that patients are not used to having something in their mouth that is not food. The brain senses this appliance as "food" and sends messages to the salivary glands to produce more saliva and to secrete it at a higher rate. New dentures will also be the inevitable cause of sore spots as they rub and press on the mucosa. A few denture adjustments for the weeks following insertion of the dentures can take care of this issue. Gagging is another problem encountered by some patients. At times, this may be due to a denture that is too loose fitting, too thick or not extended far enough posteriorly onto the soft palate. At times, gagging may also be attributed to psychological denial of the denture. (Psychological gagging is the most difficult to treat since it is out of the dentist's control. In such cases, an implant supported palateless denture may have to be constructed or a hypnotist may need to be consulted). Sometimes there could be a gingivitis under the full dentures, which is caused by accumulation of dental plaque. Another problem with dentures is keeping them in place. There are three rules governing the existence of removable oral appliances: support, stability and retention. The fabrication of a set of complete dentures is a challenge for any dentist, including those who are experienced. There are many axioms in the production of dentures that must be understood, of which ignorance of one axiom can lead to failure of the denture case. In the vast majority of cases, complete dentures should be comfortable soon after insertion, although almost always at least two adjustment visits will be necessary to remove sore spots. One of the most critical aspects of dentures is that the impression of the denture must be perfectly made and used with perfect technique to make a model of the patient's edentulous (toothless) gums. The dentist must use a process called border molding to ensure that the denture flanges are properly extended. An endless array of never-ending problems with denture may occur if the final impression of the denture is not made properly. It takes considerable patience and experience for a dentist to know how to make a denture, and for this reason it may be in the patient's best interest to seek a specialist, either a Denturist or a Prosthodontist, to make the denture. A general dentist may do a good job, but only if he or she is meticulous and usually he or she must be experienced. Some patients who believe they have "bad teeth" may think it is in their best interests to have all their teeth extracted and full dentures placed. However, statistics show that the majority of patients who actually receive this treatment wind up regretting they did so. This is because full dentures have only 10% of the chewing power of natural teeth, and it is difficult to get them fitted satisfactorily, particularly in the mandibular arch. Even if a patient retains one tooth, that will contribute to the denture's stability. However, retention of just one or two teeth in the upper jaw does not contribute much to the overall stability of a denture, since a full upper denture tends to be very stable, in contrast to a full lower denture. It is thus advised that patients keep their natural teeth as long as possible, especially their lower teeth. Another new advance in the field of complete and partial dentures is implant supported over dentures where titanium implants act as support for the denture prosthesis giving immense support and stability to the denture. The implant work at smile 'n' shine dental care centre is done by Dr Rajat Sethi who has done immense work in the field of implantology and patients are well adviced to explore the possibility of implant supported over dentures, economics permitting.